Fiber Optic Networking | Share the information about fiber optic networking. PoE switch is self-adaptive. When the PSE has the power supply requirement, the PD will output the voltage to the PSE. This means the switch can be powered by PoE while simultaneously providing power by PoE to other devices such as IP phones or wireless access points. This provides great flexibility because it means that the switch can be deployed without the constraints of an AC power outlet. As for powering PoE switch from a PoE switch, Universal PoE (UPOE) technology will be required and the following part will talk about UPOE. The following figure shows the evolution of PoE technology. To keep up with growing enterprise networks, transmission speeds and expansions in data center capacities are constantly changing, from 1G, 10G, 40G to 100G. And obviously, 100G will become the mainstream. It is said that by 2019, 100G Ethernet will make up more than 50 percent of data center fiber optic transmissions. To smoothly migrate to 100G Ethernet, 100G switch plays an important role. This article will guide you to have a closer look at 100G switch market and introduce several 100G switches. The FS.COM N8500-32C switch is a 32 port 100G switch. It has 32 100GbE QSFP28 ports and can achieve 6.4 Tbps full-duplex switching capability. In addition, FS.COM N8500-32C 100G switch uses Broadcom ICOS as its operating system. Designed in a compact 1U form factor, it is ideally suited for high performance and programmable data center environments. As a 100G ToR switch, FS.COM N8500-32C 100G Ethernet switch provides line-rate, high-bandwidth switching, filtering, and traffic queuing without delaying data. Redundant power and fans along with numerous high availability features ensure that N8500-32C is always available for business-sensitive traffic. With support for advanced features, including MLAG, VxLAN, SFLOW, SNMP, MPLS etc, FS.COM N8500-32C switch is a good choice for traditional or fully virtualized data center. This 100G switch price is US$ 9,199.00. Dell Networking S6100-ON Switch is a 2RU high-density 10/25/40/50/100GbE fixed switch with choice of up to 32 ports of 100GbE (QSFP28), 64 ports of 50GbE (QSFP28), 64 ports of 40GbE (QSFP+), 128 ports of 25GbE (SFP28) or 128 ports of 10GbE (using breakout cable) and two fixed SFP+ ports of 10GbE/1GbE/100MbE. It provides up to 6.4 Tbps of switching I/O bandwidth (full duplex) and non-blocking switching fabric delivering line-rate performance under full load with sub usec latency. Dell Networking S6100-ON 100G switch supports Dell EMC Networking’s Open Automation Framework, providing enhanced network automation and virtualization capabilities for virtual data center environments. It is a 100G ToR switch which can provide high-density 10/25/40/50/100GbE ToR server aggregation in high-performance data center environments. This 100G switch price is US $4,717.65. Broadcom StrataXGS Tomahawk II switch was released on October, 2016. It supports up to 64 ports 100GE or 128 ports of 40GE/50GE with SDN-optimized packet switch engines operating at 6.4 Terabits per second. The StrataXGS Tomahawk II offers increased bandwidth capacity, scalability, and cost efficiency for mega data centers and high performance computing (HPC) environments. Manufactured in 16nm, Tomahawk II integrates 256 serdes running at over 25 Gbps, with large on-chip forwarding tables and packet buffer memory. With next generation BroadView instrumentation and control capabilities, Tomahawk II provides enhanced traffic load balancing, network visibility and control of traffic provisioning. Tomahawk II’s proven architecture and comprehensive feature-set will enable partners to develop and deploy solutions more quickly, accelerating the transition to high density 100GE interconnect. The HPE FlexFabric 5950 32QSFP28 switch is a 32 port 100G switch whivh provides advanced features and high performance in a top-of-rack, data center switch architecture. It has 32 QSFP28 and 2 SFP+ ports, dual hot-pluggable power supplies and six fan trays. In addition, it can provide up to 3.2 Tbps switching capacity. This 100G ToR switch utilizes intelligent Resilient Fabric (IRF) technology which simplifies the architecture of server access networks. With ultra-low-latency, HPE FlexFabric 5950 32QSFP28 switch is ideally suited for deployment at the spine and server access layer in large enterprise data centers. This 100G switch price is US $17,037.99. The telecom industry develops rapidly and higher bandwidth networking is a trend. The 100G Ethernet’s time will come soon and 100G switch market gradually receives much attention. This article introduce several kinds of 100G Ethernet switches and I hope it can help you choose a best network switch for your 100G networking. UniFi US-24-500W switch is a 24 port PoE switch which comes with 24 Gigabit RJ45 ports and 2 SFP ports. Its non-blocking throughput is up to 26 Gbps and the switching capacity is up to 52 Gbps. UniFi US-24-500W PoE switchh is a fully managed Gigabit switch which can deliver robust performance and intelligent switching for networks. Besides, it offers the forwarding capacity to simultaneously process traffic on all ports at line rate without any packet loss. It is really a cost-effective PoE switch at $399.00. The above content Gigabit switch review has recommend 8 port unmanaged Gigabit switch, 12 port 10G smart managed switch, 24 port PoE switch and 48 port 10GBASE-T copper switch. All of them are good choices when compared with the same type of Ethernet switches. I hope this article can help you choose the best switch when you feel confused. High speed data transmission is the prerequisite for enterprise network deployment. For big data centers, 40G is still the mainstream. For 40G network, 40 gbps transceiver and 40gb ethernet cable are important components, and they can be classified according to transmission distance. For long transmission distance, there are 40G LR4 QSFP+ transceiver and singlemode fiber cable; for short transmission distance, there are 40G SR4 QSFP+ transmission and multimode fiber cable. In addition, for 40G short link, there is QSFP+ DAC cable. Two types of QSFP+ DAC cables are available on the market: 56G QSFP+ DAC vs. 40G QSFP+ DAC, what’s the difference between them? This article will make a comparison. We know that DAC cable is a kind of high speed passive copper cable with one connector on each end. The connectors are not real optical transceiver modules but in the form of optical transceiver module. DAC twinax cable Therefore, QSFP+ DAC consists of two QSFP+ transceiver style connectors and one twinax copper cable. With the same construction, the operation of 56G QSFP+ DAC and 40G QSFP+ DAC in 40G network deployment is the same, too. Just plug the connector into 40G QSFP+ port on the switch on both sides, and then you can get 40G link. Here is a figure of QSFP+ DAC cable for you. As qsfp+ passive copper cable, both 56G QSFP+ DAC and 40G QSFP+ DAC are QSFP MSA compliant. But 40G QSFP+ DAC supports 40G InfiniBand 8x DDR, 4x QDR, 10G/40Gigabit Ethernet, Fibre Channel, while 56G QSFP+ DAC supports 40G InfiniBand 4x FDR, 56Gigabit Ethernet, Fibre Channel. What’s the different between InfiniBand DDR, QDR and FDR? InfiniBand (abbreviated IB) is a computer-networking communications standard used in high-performance computing that features very high throughput and very low latency. It is used for data interconnect both among and within computers. InfiniBand is also used as either a direct or switched interconnect between servers and storage systems, as well as an interconnect between storage systems. And the following figure shows InfiniBand specification. We know that QSFP+ DAC cable uses four channels for data transmission. And for 40G QSFP+ DAC, it supports 40G InfiniBand 8x DDR, 4x QDR, so each channel can achieve 10G data rate; for 56G QSFP+ DAC, it supports 40G InfiniBand 4x FDR, so the maximum data rate of each channel is 14G. Characterized by low Insertion loss and power consumption, qsfp+ passive copper cable is a cost-effective option for 40G data transmission over short distance. As for 56G QSFP+ DAC vs. 40G QSFP+ DAC, the only different is that the former can operate high bandwidth than the latter one. Therefore, if your network needs 40G data transmission, then 40G QSFP+ DAC cable; if you need more than 40G bandwidth, then choose 56G QSFP+ DAC. Now power over Ethernet switch gains great popularity among many users which utilizes PoE technology. But still some people know little about PoE technology. This article will focus on practical use of PoE technology. When connected with other network devices, PoE switch will detect whether they are PoE-compatible devices and enable power automatically. Therefore, it is the simplest solution to add PoE to your network by using PoE switch and PoE-compatible devices. Non-PoE switch can support PoE function when connected to PoE injector by a network cable. Then PoE-compatible devices are connected to PoE injector. The whole cabling solution is completed. It is not hard to see PoE injector can be used to upgrade existing LAN installations to PoE, especially when fewer PoE ports are required. 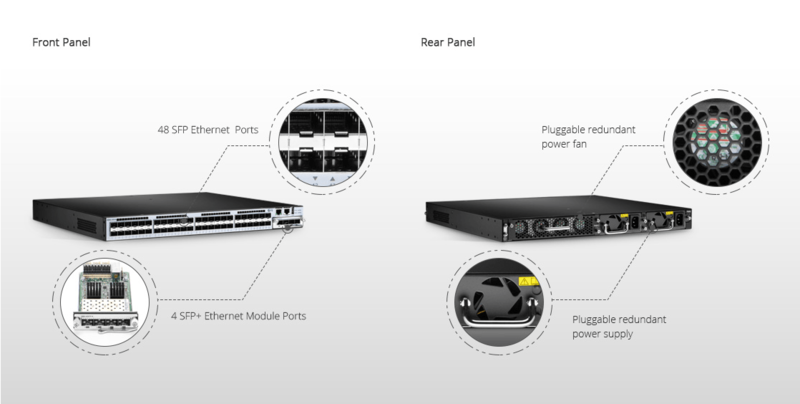 In this cabling solution, PoE switch has to be connected to PoE splitter which separates the data and power transmission. The PoE splitter has two output lines, one is the power output line and the other is network data signal output line. For example, you need one cat5e ethernet cable to connect PoE switch with PoE splitter, another one cat5e ethernet cable to connect PoE splitter with non-PoE device. In addition, you have to add power cable between PoE splitter and non-PoE device. Finally, the whole deployment will work. Both PoE injector and PoE splitter are used in this cabling solution. PoE switch connects to the PoE injector, then the PoE splitter, and finally transmits to non-PoE devices. In fact, this solution makes cabling more complicated. But if you need, you can do it. Note: To help you have a better understanding of practical use of PoE technology, the above four cabling solutions are shown in the following figure. PoE technology can support data and power transmission over one network cable at the same time, which simplifies the cabling process. I hope after reading this article, you can know more about practical use of PoE technology. What’s more, before you plan to use PoE, choosing quality and cheap PoE switch and network cable is important, or you may get poor network performance.